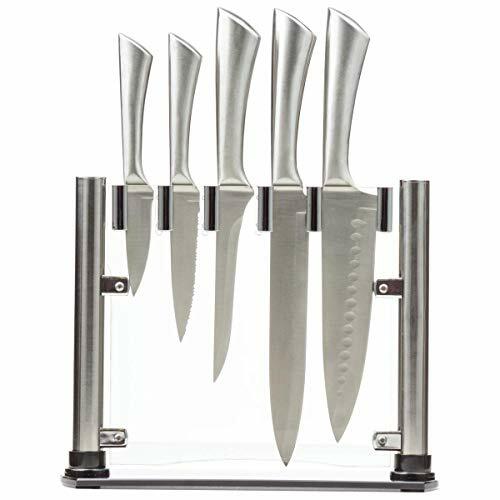 Slitzer’s 5-piece Stainless-Steel Kitchen Cutlery Set with Acrylic Stand is an affordable set of durable professional-grade kitchen knives. Set includes a honed 8″-long 2.5 mm Santoku-style chef’s knife, an 8″-long 2 mm carving knife, a 3″-long 2 mm paring knife, a 5.5″-long 2 mm boning knife, a serrated 4.5″-long 2 mm utility knife and a sleek acrylic stand. Forged out of incredibly dependable 3CR13 stainless-steel for long-lasting reliability, our low-cost knife set sharpens easily and is naturally resistant to corrosion. Featuring stainless-steel hollow handles, our economic set of pro kitchen knives chop fruits, vegetables, breads, cheeses and meat with mouthwatering ease. ABOUT: Slitzer Germany is a respected producer of dependable heavy-duty cutlery that gives home foodies, culinary students, novice and professional chefs a fine set of cutting tools for a budget price that will last a lifetime. HIGH-QUALITY KITCHEN KNIVES: Slitzer’s 5-piece Stainless-Steel Kitchen Cutlery Set with Acrylic Stand is an affordable set of durable kitchen knives that give you the practical culinary confidence to prepare any sumptuous meal you can imagine! PROFESSIONAL-GRADE CUTLERY: Set includes a honed 8″-long 2.5 mm Santoku-style chef’s knife, an 8″-long 2 mm carving knife, a 3″-long 2 mm paring knife, a 5.5″-long 2 mm boning knife, a serrated 4.5″-long 2 mm utility knife and a sleek acrylic stand. SUPERIOR CRAFTSMANSHIP: Forged out of incredibly dependable 3CR13 stainless-steel for long-lasting reliability, our stylish knife set sharpens easily and is naturally corrosion-resistant-providing a lifetime of daily, as well as increasingly vigorous use. INNOVATIVE ENGINEERING: Featuring elegantly-designed stainless-steel hollow handles that are robustly thick and feel perfect in either hand, our economic set of pro kitchen knives chop fruits, vegetables, breads, cheeses and meat with mouthwatering ease. RENOWNED ELEGANCE: Slitzer Germany is a respected producer of dependable heavy-duty cutlery that gives home foodies, culinary students, novice and professional chefs a fine set of cutting tools for a budget price that will last a lifetime. Very good knives I was surprised at the quality of the knives and the value. I love my new knives. Nice design, but dont stay in the dishwasher for so long I like the design, but I can see rust after being left in the dishwasher.